More than ever, businesses are struggling to compete for customer engagement in the social space. Research from marketing consultancy firm Edelman found that 60% of global consumers no longer trust social media networks. If 2018 was a tough year for marketers to regain trust on social media, 2019 signifies an important one for brands to become more agile in adapting to customer needs. We've identified an overview of the key social media trends for brands to watch for this year. Contrary to what skeptics believe, the Stories feature (short user-generated photo and video collections that disappear after 24 hours) is not just a fad, but rather here to stay. As of May 2018, nearly a billion users across Facebook, Instagram, Snapchat and Whatsapp are already sharing through Stories everyday. Within this year, the feature is set to surpass feeds as the primary way people share things with friends. More platforms are hopping onto this bandwagon - YouTube has recently launched its beta Stories feature for its creators with over 10k subscribers. The main reason why Stories are so enticing to users’ engagement is its intimacy. Stories are ephemeral and visual, allowing users to capture immediate experiences and decorating them with text, audio, drawings, filters and stickers. Another reason for this is that Stories allow users to watch vertical videos, which feels much more comfortable and enjoyable than horizontal videos on a smartphone. Brands are quickly embracing Stories, with 4 out of 5 major brands already using the format to share location-specific content and engage customers. For content teams, it’s key to have a Stories strategy that can create a consistent brand identity while creating production value for your product. Consider using motion graphics and features such as polling, Q&A or behind-the-scenes takeovers on topics that interest your customers the most. Since the Stories feature varies between different platforms, it's also worth having different approaches and solutions to build engagement with your customers. Since 2015, organic engagements on social media have consistently been declining. This is because social media platforms are encouraging brands to spend more money on ads to generate the same social traffic. Because of this, marketers now realize they're facing increased competition in the paid social ad space. Now, simply sharing content across networks only results in low reach and referral traffic. To increase overall customer engagement, brands are pairing social ads with relevant organic content. As such, content creators now use both creativity and data-driven skills to leverage audience and context data to produce engaging content. If you want to focus your efforts on the top-performing content type, live videos and other video forms are proven to generate the highest engagement for brands. Remember that the end goal is not broadcasting content at an audience, but to create timely content that earns trust and provides value while appearing genuine to customers. 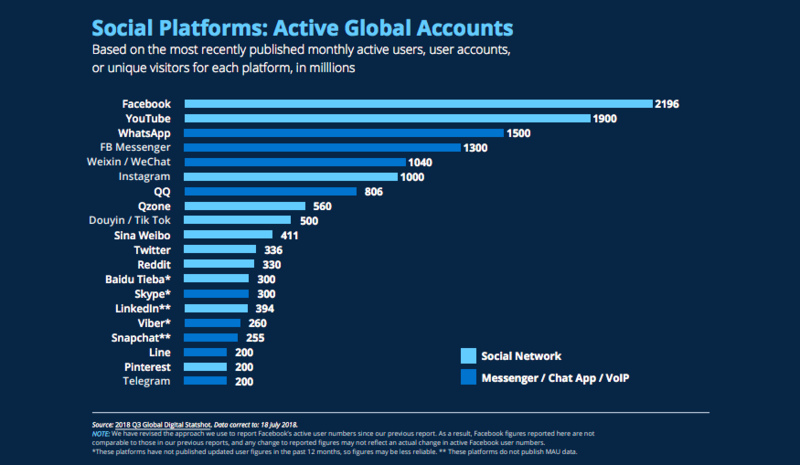 According to research by We Are Social and Hootsuite, top messaging apps such as WhatsApp, Facebook Messenger and WeChat now collectively count almost 5 billion monthly active users. This shift from public to private spaces are staggering across the board as users are more inclined to share to a smaller audience on social. Consumers now expect to use messaging to communicate with business, with 69% of U.S respondents in a Facebook study agreeing that directly messaging a company increases their trust in the brand. However, meeting the needs of customers in one-to-one communication can be challenging for businesses. To up your messaging game, it's important to have a consistent voice across all your channels to build your brand, while making sure you are not being too obtrusive to customers. AI-powered messenger bots can be helpful to help you engage with all relevant conversations, but they aren't the complete solution to messaging. Ultimately, you should use social media guidelines to align marketing and customer support teams in how they interact with customers. The volatility and changing nature of social media can be difficult for brands to navigate. In the near future, consumers will demand more value from brands in the social space in exchange for their time and data. The challenge lies ahead for businesses to better adapt to customers needs to boost their return on investment in social media. Learn how to structure your social media guidelines for different functional teams and what you need to include in each section.